Preheat the oven to 180C/fan 160C/gas mark 4/356F . Grease a 20cm/8inch deep round cake tin and line the base with baking parchment. - Chop the walnuts coarsely. - Grate the carrots coarsely too. - Mash two ripe bananas with a fork. - Measure all the ingredients in a big bowl and gently mix them together. Be sure, not to over mix. - Turn the batter into the prepared tin and level the surface. - Bake for about 50-60 minutes or until the cake is well risen and shrinking away from the sides of the tin. - When the carrot cake is baked leave it in the tin for a few minutes, then turn it out and finish cooling on a wire rack. - For the topping: Put 50g of butter in a warm place to get it really soft. Measure all the ingredients into a bowl (except walnuts) and give them a good stir with a fork. You can also use food processor. Mix until soft and smooth. - Spread the mixture with a spatula or a knife over the top of the cake. Decorate the top with chopped walnuts. - Chill for a few minutes before serving, and store in the fridge as the topping is soft. STEP 1:Preheat the oven to 180C/fan 160C/gas mark 4/356F. Chop the walnuts coarsely with a sharp knife. STEP 2:Grate the carrots coarsely too (take care of your fingers and knuckles). STEP 3:Mash two ripe bananas with a fork. STEP 4:Measure all the ingredients in a big bowl and and gently mix them together. STEP 5:Do not over mix! STEP 6:Grease a 20cm/8in deep round cake tin and line the base with baking parchment. STEP 7:Turn the batter into the prepared tin and level the surface. STEP 8:Bake for about 50-60 minutes or until the cake is well risen and shrinking away from the sides of the tin. You need 200g of soft full-fat cheese. STEP 11:Measure all the ingredients (soft cheese, softened butter, icing sugar and vanilla extract) into a bowl (except walnuts). STEP 12:Give them a good stir with a fork (you can also use a food processor). Mix until soft and smooth. 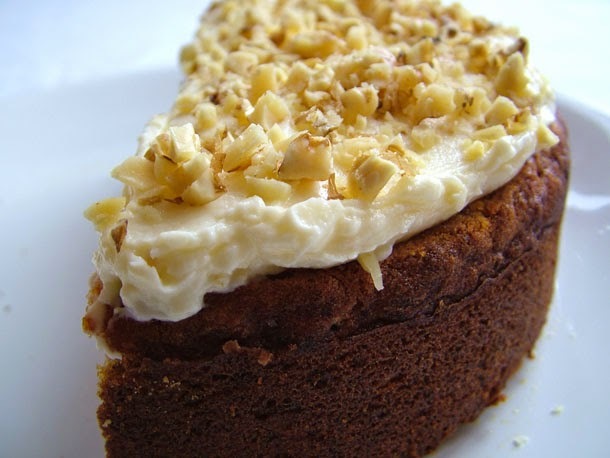 STEP 13:Spread the cheese mixture over the top of the cake and decorate with chopped walnuts. Leave the cake in a fridge for a few minutes before serving. This cake turned out totally yummy!